A new, epidemic strain of C. difficile is proving alarmingly deadly, and new research from the University of Virginia School of Medicine not only explains why but also suggests a way to stop it. Until now, scientists have not understood what made this strain worse than other strains of the bacteria, the most common cause of hospital-acquired infections. The new strain kills up to 15 percent of infected patients, including those who receive antibiotics, and has become increasingly common over the last 15 years. This has prompted the federal Centers for Disease Control and Prevention to label it an "urgent threat." The finding comes from the lab of Bill Petri, MD, PhD, chief of UVA's Division of Infectious Diseases and International Health, and a team of international collaborators. 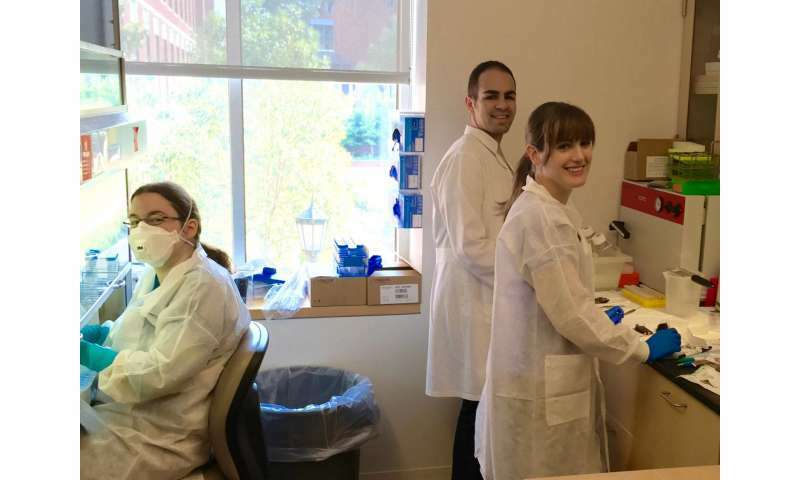 PhD student Carrie A. Cowardin was working in Petri's lab when she discovered the diabolical mechanisms this strain of C. diff uses to overcome the body's natural defenses. The strain is so deadly because it produces a toxin that kills protective cells, called eosinophils, found in the gut, Cowardin found. By destroying the gut's natural barrier, the bacteria can spread inflammation throughout the body. "We think that this toxin makes disease more severe by killing beneficial eosinophils, which seem to play an important role in promoting a healthy immune response during C. difficile infection. When the eosinophils were depleted with an antibody or by the toxin, we saw dramatically increased inflammation. Restoring eosinophils by transferring them from a mouse that cannot recognize the toxin prevented the damage inflicted by the epidemic strain," said Cowardin, now a postdoctoral fellow at Washington University in St. Louis. "This builds on previous work in our lab showing that eosinophils are beneficial and suggests that one reason this strain causes such severe disease is due to its ability to kill these cells." Further, Cowardin discovered exactly how the toxin works, and how well it functions in this role. The toxin, she determined, requires a particular human protein that recognizes bacteria, a protein that plays a key role in the immune response. In short, C. diff is subverting the body's natural defenses to overcome those defenses. This understanding of the toxin's action could be of great importance, as blocking it can rescue the protective cells in the gut. And that approach could lead to a new treatment to stop this deadly strain of C. diff in its tracks. "Nearly every day that I care for patients I am faced with this potentially deadly infection," Petri said. "Carrie Cowardin's discovery of why this strain of C. diff is so dangerous, and most importantly how to combat it, is a huge and most needed advance." What makes C-Diff superbug deadly?